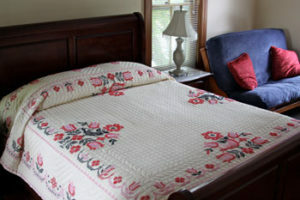 Blue Rock Bed & Breakfast is well-located for vacation or business travel. We have accommodations for the entire family: Two suites with multiple beds, and a Family Cabin suite with kitchenette and private entrance. Pets are allowed in Family Cabin suite only. 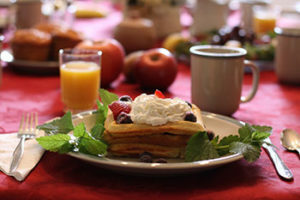 We serve a complimentary home-cooked breakfast. Our pricing is family-friendly as well with the base rate for two persons, and additional persons $25 each (children $15). We also discount the rate 21% for consecutive multiple nights stay. 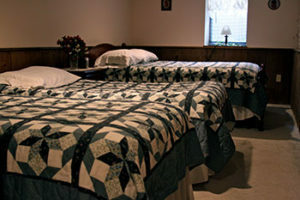 Ammenities abound including queen beds, private baths, parking, wifi, and many comforts of home. We are located 2 blocks from Milersville University, 3 miles from Franklin & Marshall, 4 miles from Lancaster County Convention Center (City square), and minutes from all the popular attractions like Sight and Sound Theater, Amish farms, and outdoor activities. A lovely community park is across the street. Click to see our special offers and getaway packages and call us for more details. We offer Sight & Sound Theater discount tickets, personal tour arrangements, restaurant discounts, getaways for small groups, personal retreats, and more. As an option, time may be scheduled with host and certified counselor Ed Hersh as a safe place for healing and spiritual growth. Find out more about pastor & missionary debriefing and consulting, value-added retreats, Christian counseling, marriage enrichment, and training in healing prayer ministry. Faith-based getaways and personal/ministry retreats are a specialty. Dr. Hersh has authored a book called Escaping the Pain of Offense: Empowered to Forgive from the Heart. Read free articles at Refuge blog. See more Lancaster, PA bed & breakfasts.